This review was previously posted on my column over at ldsblogs.com. I would love if you guys checked out that column and maybe added a comment or two. It would make my day! Welcome to another week’s pick for Family Movie Night! This marks my 10th entry in this column (12th video on my channel). I’ve really enjoyed working on the series so I hope you have as well. Today I hope I can introduce you to a series which may have fallen outside your radar. Since 1953’s Peter Pan, Tinker Bell has become one of the most iconic figures in all of Disney. Tinker Bell is even the one that puts the sparkly ring around the castle in the Disney logo. 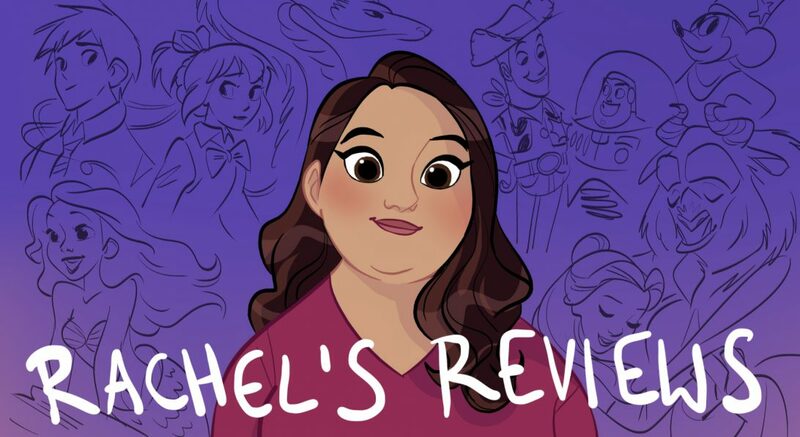 With this kind of notoriety, it was probably only a matter of time before everyone’ favorite fairy got the starring treatment in a Disney film. And not only one film but a series of to this point 7 films! It might seem easy to discount a direct to DVD series like the Fairies franchise but I’m telling you they are well done. The voice talent is top notch. The animation is bright and colorful and the stories are predictable but entertaining. But most importantly I like what the characters and message give to young girls who the franchise is mainly aimed at. With the exception of Frozen it is no secret girls get the short end of the stick when it comes to magic or superheroes in animated movies. Of the 13 current Disney princesses (or Princesses in waiting as Elsa and Anna are designated. ), Elsa and Rapunzel are the only ones with magical powers. Many Disney female villains have magical powers like Maleficent, the Evil Queen, Madame Mim, Ursula, or Mother Gothel but basically none of the good girls (strange isn’t it?). The fairies from Sleeping Beauty are one of the only notable exceptions but they are the side characters not the leads. You could say the same thing about other popular franchises which sometimes have a token hero female like Black Widow in Avengers, Hermione in Harry Potter, or Wonder Woman in Justice League. 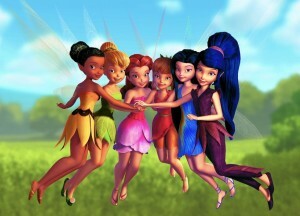 This makes what girls get in the Tinker Bell series special because it is almost all about girls and they each have a special power that makes them unique. In the first film, Tinker Bell, we get to see Tink created (Mae Whitman) and find out she has a special skill called tinkering- basically a knack for inventing things and putting stuff together. The problem is she lives in Pixie Hollow and the most prestigious job is to be part of the nature fairies who go to the mainland and wake it up for the day and help the seasons change. Silvermist (Lucy Lieu)- she is the fairy over water and helps make dewdrops for the plants. Fawn– (America Ferrera)- she is the fairy of nature and connects with all the animals in the forest. There is also Vidia (Pamela Adlon) who is Tink’s rival and Queen Clarion (Angelica Huston) who rules Pixie Hollow. Tink likes working in the tinkering department but she is still jealous of the nature fairies that can wake up the mainland. This makes the main story of Tinker Bell a unique one of Tink both learning to value her own talents and abilities while also expanding into new worlds and dreams. The voice work is top notch in this and all the Tinker Bell films and this first film sets the groundwork for all the characters and the world we will get for 7 more films.. Think of it as an origin story in a way. It is not one of the best of the series but it is a good first step into the world of Pixie Hollow. And I do like the message of accepting who you are while still dreaming big. Overall, it is a well animated, entertaining first step into a great series especially your daughter will love. Think of it as the Avengers for girls! That said, I don’t think your boys will have a terrible time watching Tinker Bell. There are several boy characters and girls like Fawn who are more tomboys. It’s not like the Barbie movies which are more exclusively girls only. 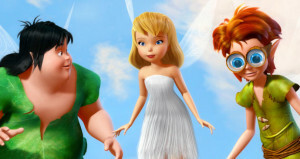 Tinker Bell is definitely a film and series that is geared more towards children but I find them tight enough and engaging enough to greatly enjoy. Just give them a try and have an open mind and I bet you will like them too. Enjoy your time in Pixie Hollow! 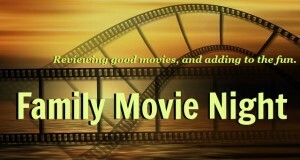 I would love to get some feedback from the readers on these choices for Family Movie Night. I have tried to do a variety so you aren’t watching the same type of movie each week; however, if you’d like more of a particular style or type please let me know. Put in the comment section any feedback on how your kids react to this or any other film I have reviewed. I surprisingly liked the movie or at least found it enjoyable and not a bore to watch. 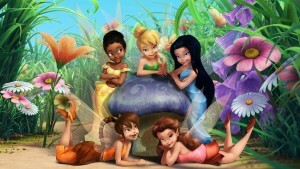 I just wasn’t too fond of how the character of Tinker Bell got so diluted. I’m glad you liked it. I think they add a lot to Tinker Bell as the series goes.